Amazing experience. Super family friendly and professional. My children left not just with clean teeth but educated andsome cute prizes. Love this place. Amazing experience. Super family friendly and professional. My children left not just with clean teeth but educated and some cute prizes. Love this place. The team was amazing, everything was super nice, helpful and answered all my questions. Will definitely be coming back. Dr. Ali Behzadi received his dental degree from Rutgers, the State University of New Jersey. He then completed a one-year residency in advanced education in general dentistry (AEGD) at Lutheran Medical Center in Brooklyn, New York. After practicing dentistry for 10 years in New York he moved to Florida in 2001 and chose Orlando as his home. He is currently practicing at Your Downtown Dentistry. Since then he is faithfully committed to providing the utmost care and comfort for his patients, whether they need a root canal or are coming in for their very first dental visit. Dr. Behzadi is on the cutting edge of the latest advancement in his field by maintaining membership with professional organizations such as American Dental Association and American Academy of Cosmetic Dentistry. His state of the art practice is equipped with the latest technology, and he, along with a team of oral surgeons, implantologists, and pediatric dentists, have created one of the finest multi-specialty family practices in Central Florida. 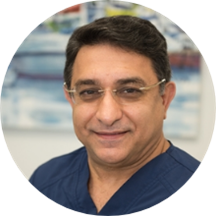 Dr. Behzadi welcomes his patients to his practice and looks forward to meeting their dental needs and making them smile with confidence. I didn't have to wait for any part of the exam or cleaning. It was a great experience. He took his time to explain everything to me. He was very helpful and friendly!